Many times hoaxes are made with good intention, in the case of the alleged “Arecibo Reply” these false agroglyphs were made just to promote the interest on these issues, however a hoax is a hoax and it cannot be accepted. There were some skeptics who were right to declare emphatically that the “Arecibo reply” was a hoax, but their opinion lacks of value because they are incapable to separate the wheat from the chaff. To this day, Skeptics believe that all the crop circles are made by hoaxers or by the owners of the fields just to earn some money. However, they fail to explain those genuine crop circles that have complex patterns, which are very difficult for humans to replicate. Interlocutor: Master, now I’d like to approach a topic related to the Arecibo message, which was a message sent to the space in order to see if some extraterrestrial entity would answer it, this message had information related to our civilization, like human DNA, our solar system, human population etc., We know that Frank Drake, Carl Sagan and other people sent this message from the Arecibo radio telescope in Puerto Rico in 1974. On August 19, 2001, 27 years later, mysterious agroglyphs appeared next to the Chilbolton radio telescope in Hampshire, England; it was said that these agroglyphs were the answer from extraterrestrial entities to the Arecibo reply sent in 1974. Well, I have the images from the Arecibo reply here that you perceive. What is the truth about this case? Ruanel: Correct, but here I am going to give another slap, so-to-speak. Everything was hoaxed. Interlocutor: What? I can’t believe it! Was Carl Sagan also involved in the hoax? Interlocutor: So, the rectangular image that I mark here, similar to the crop circles, was it made by human beings? Ruanel: Yes, it was made by human beings. There are races that have a similar morphology to the picture you are showing. I perceive them at conceptual level since the vessel has his eyes closed. These type of races exist and there are several races with a different skull shape from the human being, they have a scientific denomination that the vessel doesn’t grasp it from me, but this description is unreal. Interlocutor: So, the real event is that Carl Sagan and other people sent this message. Yes? Ruanel: Repeat again the date for the record. Interlocutor: …The Arecibo message was sent in 1974. Interlocutor: Well, this is the only thing real about this case and what about the “Arecibo reply”, who made it? Ruanel: They themselves, and when I say they, I’m not involving all of them, but some people that have hoaxed an alleged reply. Interlocutor: And the other image? Who made this rectangular image here on the field? Ruanel: It was directly hoaxed just to promote that this reception was real. Interlocutor: Did Carl Sagan know about this? Interlocutor: Was Frank Drake involved in the hoax or he was also another naive person? Ruanel: No, he was actually involved. Interlocutor: Well, let's not speak about this anymore, if it is a hoax. Interlocutor: Okay, How long did they take in making these agroglyphs on the fields? It seems that they are well-made. Ruanel: They are well-made, somehow they have made them pretty well. Interlocutor: How many days did they take in making these false agroglyphs? Interlocutor: And nobody discovered that they were working on that? Ruanel: No, because anyone that was coming to investigate, they simply said that they were working on a topic and they didn’t allow anybody to pass. Interlocutor: If you agree, we can start with the questions, the first thing is to clarify an apparent mistake related to the previous session regarding the hoaxed reply from the Arecibo message, which appeared on August 19, 2001 next to the Chilbolton radio telescope in Hampshire, England. In the session it was said that Carl Sagan believed that the message was real, which is something impossible because he passed away in 1995 and by the date of his death, these false agroglyphs had not been made yet. Interlocutor: Ah! I see, then, it was my mistake obviously. Ruanel: Secondly, the researcher was referred to Crop Circles which were made in Harborough and Petersfield -in Hampshire- close to the other hoaxes, which were made in 1994. Interlocutor: So, the researcher was referred to fake crop circles made on a previous reply to the alleged reply in 2001? Interlocutor: Was there connivance with the observatory that was there? Ruanel: Sure, but we are talking about the hoaxes made in 2001, the others hoaxes were made in Harborough and Petersfield. Interlocutor: Is that information available on the Internet? Do you perceive it? Ruanel: I don’t perceive it because they are minor hoaxes, but they are not minor towns at this point so that they could be unnoticed. Interlocutor: Okay, then this is clear, the reference was made to previous agroglyphs, which were unknown. Ruanel: Correct, then we are talking about two different fields and there is a third field that the Master Johnakan had named that I don’t know. Interlocutor: So about this, Carl Sagan had nothing to do with it, he just believed it and nobody told him. Ruanel: No. He was not involved in that connivance. Interlocutor: Of course, and the same people were always involved in this case? Ruanel: That’s right, besides there is something important, as you always say, and it’s a matter of common sense, the agroglyphs usually made by human beings are coarse or rudimentary. 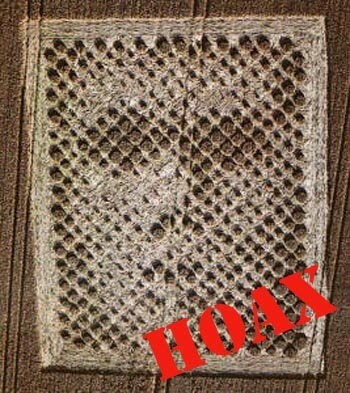 In this case the hoaxers have been very careful to make them very similar to the genuine crop circles. We are calling genuine crop circles to those which were made by extraterrestrials. Interlocutor: Okay, now everything is clear. This entry was posted at Monday, August 09, 2010 and is filed under Secrets . You can follow any responses to this entry through the .